“This release marks the debut of Brussels’ duo Sendai. Longtime friends Yves De Mey (aka Eavesdropper) and Peter Van Hoesen team up and deliver the fourth installment on Time To Express. 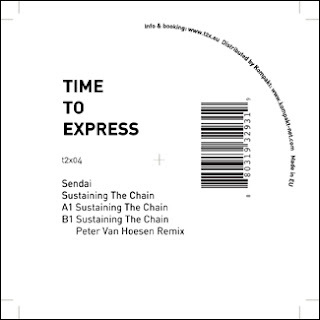 The original version of Sustaining The Chain provides a glimpse into the duo’s shared interest in pure, energetic techno. After a three minute build-up the track arrives at the core of its being: a growling, deep bassline, ever expanding and evolving, sustained by swirling effects and sparse percussion. This is techno stripped down to its essential elements, while deploying the full impact needed to move a crowd during peak time. Mastered by CGB at Dubplates & Mastering, Berlin.